Fun Friday: How picky an eater are you? Every so often on social media, a fun questionnaire will come across my husband’s feed and he’ll call out the questions, and have us answer them. It’s all just for fun, but the one he had us answer this past weekend was interesting as we heard each other’s answers, and I thought I’d share it here as well. The topic was “How Picky an Eater Are You?” There seem to be several versions of this test out there, with a different variety of food items on each one, but they’re all fun to explore. We often categorize children as picky eaters, and it’s often quite challenging to feed a picky eater, but adults can be plenty picky too! As a kid in my own family growing up, on our 12th birthday we were allowed to choose on thing we never had to eat again. My one thing was orange juice and my brother’s one thing was green beans. What would your one thing be? How picky an eater are you? To find out, read the 60 types of food on this list and give yourself one point for each thing you don’t eat. The more points you have, the pickier you are. There were some things we just couldn’t eat because of allergies (seafood and gluten) but other than allergies, it’s all about what you do and don’t like. To give you something to compare to, my husband’s score was three, mine was 12 and our youngest daughter was 34. He had no food allergies to contend with, but we each have one. It’s all in fun and clearly not scientific data, so go ahead and see how you fare. If you’d like to, you can share your score in the comments. This little “cookbook” is handmade from my college roommate, Karen, circa May 1993. I still cook from it! Last week during one of my posts I mentioned a cookbook that my college roommate, Karen had made me before we graduated URI back in 1993. Despite all our moves from state to state, apartments to house, that little booklet has traveled with me and several of our regular recipes have come from it. However, there’s so many in there that I haven’t made in years. Recently I pulled it out again, as I was specifically looking for a recipe for dinner that we hadn’t made in years, probably since before we had kids. It was a huge hit, so I thought I should share it here. You don’t need a ton of ingredients for this recipe and I had everything on hand even though I hadn’t planned it in advance. This recipe is all the things I like: quick and easy, one pan, and budget friendly. I had a pack of ground turkey in the fridge and everything else on hand in the house already. I love how it first looks when you throw it all together. 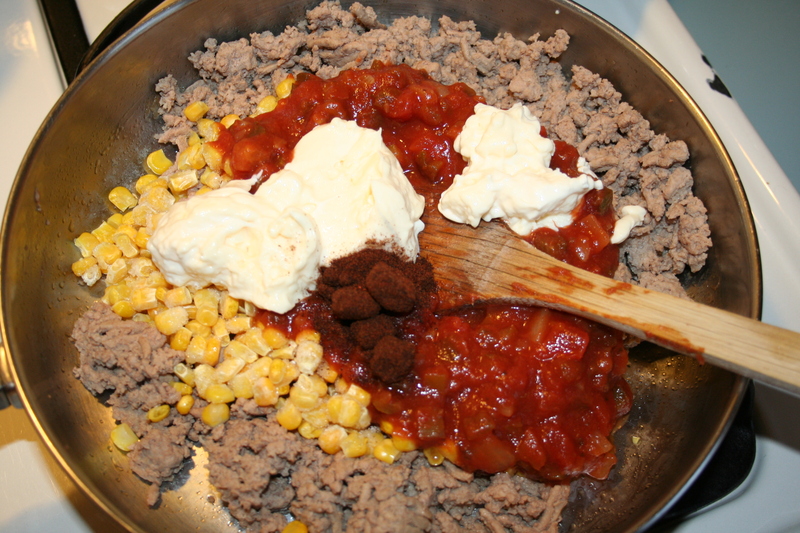 Stir in salsa, corn, mayo and chili powder. Repeat so that cheese is on top of chips. Bake 20-25 minutes until cheese is lightly crisp. Top with shredded lettuce, tomato and sour cream. My kids were so excited for this new meal, they couldn’t wait to try it out. Now you could serve it on a plate as is, or as my kids like to do, you could throw it into a soft taco and wrap it up, with all the fixins’ and eat it that way. We had a little of both at our house; some on a plate and some in wraps. Either way….delicious. 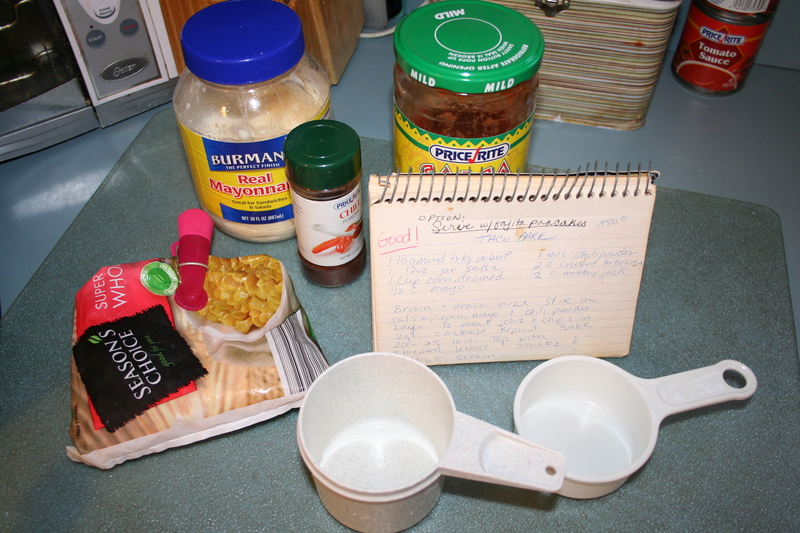 So there you have it….another one of Karen’s famous recipes from my college years. Are you ready for some Zeppole? Are you wearing your red today? I am! It’s March 19 and that means it’s one of my most favorite dessert holidays ever! Happy St. Joseph’s Day to you!! I’d personally skip right over St. Patrick’s Day and go right to St. Joseph’s Day because if it’s St. Joseph’s Day then it means……zeppole!!! You might ask: What on earth is a zeppole?? My answer is: It’s the most wonderful cream filled, fried dough dessert in the world; kind of a cross between a donut and a cream puff I guess, although from what I understand, they have changed in nature over the years. However, the way you see them here is the way I’ve always known them to be and the way that I love, love, love them. More than a decade ago, when we were first married, we lived in another state for a few years. That first year we were there, St. Joseph’s Day rolled around. We went out that day, searching for a zeppole, and had the hardest time finding them. When we did, they weren’t even all that great. I was so disappointed. We’d only been there three months and I already knew we were going to have to come back. There was no way I was going to live in a place where there weren’t any good zeppole to be had. Near us you can get a zeppole almost any time of the year, but we never, ever do, except on St. Joseph’s Day. It just wouldn’t be the same. It probably wouldn’t even TASTE the same! I’m sure it’s no coincidence either, that my daughter Alex was due to be born on St. Joseph’s Day. She wasn’t, but still, there’s something significant in that, I just know it. Being in city where there are just zillions of Italians, it means that there are also zillions of fantastic Italian bakeries in the area, so you can take your pick as to where you want to get your zeppole from. Everyone seems to have their favorite spot where they go each year. Our family has gotten their St. Joseph’s Day zeppole at Solitro’s for decades and it thrills me to share this tradition with my kids. To me it’s a really big deal to go and get them. I go to the same bakery where my family has gone forever and ever to get them. The first time I took my children there with me, I almost cried, I was so overwhelmed with the emotion I felt. I remember waiting with them in a line that stretched from the bakery counter to the door. I remember lifting them up so they could see into the back where the zeppole were being made; it looked like what I’d imagine Italy itself to look like. I remember pointing to the shelves that held trays upon trays upon trays of zeppole, all lined up in rows. It’s even magical to me how they put them into the white bakery box and tie it with string. There’s nothing like it. The zeppole taste wonderful, but the tradition and memories that go with it are such a big part of the day for me as well. The case was full, both baked and fried zeppole, and this was only the day *before* St. Joseph’s Day. And so, today I will again have my zeppole. My family doesn’t love them as much as I do, and I have to say, I’m glad. It means all the more for me. I hope you’re able to get a zeppole today too! If not, I’ll be thinking of you all as I indulge. I hope you get your zeppole fix today too! This week’s recipe is definitely a keeper at our house! 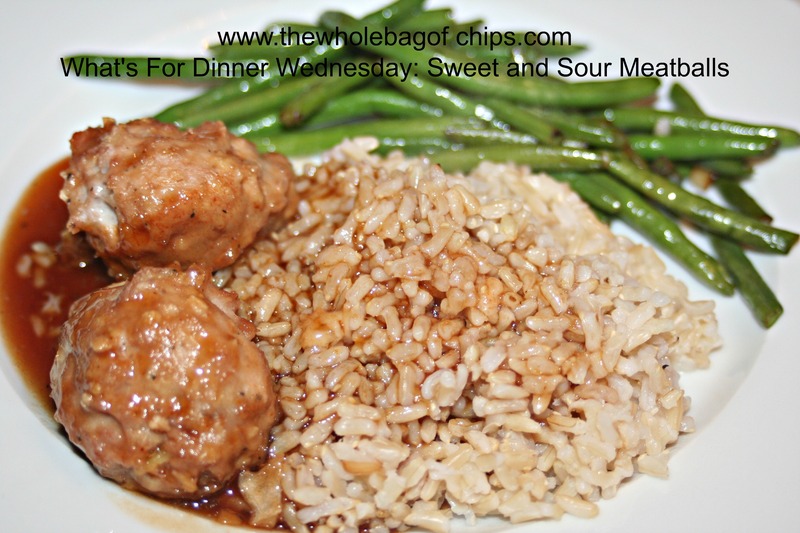 When I was in the midst of my crock pot cooking frenzy of eight weeks, I came across a crock pot recipe for Sweet and Sour Meatballs that the kids wanted me to try. I never got the chance to try them out, the recipe was still on my list of things to make in the future, but I did not like that the “sweet and sour” part of the recipe was a jar of sweet and sour sauce. I like to make things on my own when I can, so that I know exactly what I’m putting into the recipe and I can modify if I need to. In the meantime, I follow Six Sisters’ Stuff on Facebook, and this week I clicked on a link of theirs that came through for ground beef recipes, and somehow I kept clicking until I ended up at a recipe from one of the sisters, Mel, on her site, Mel’s Kitchen Cafe for sweet and sour meatballs with a homemade sauce. The Six Sisters often have some good stuff on their sites! I decided to try it out this week, and I’m glad I did! All but my little non-meat-eater, Alex, liked this recipe. LOVED this recipe. Even Alex ate one meatball. She just didn’t like it. I got so many compliments on it other than from her though, that it was well worth it! We also decided that this would be great for a party. We often do traditional meatballs in sauce, but this would be a nice change. When I made them this time, I used my larger of the two Pampered Chef scoops, the same one I use to scoop my muffin batter into my tins. If I did this recipe for a party, I’d use the smaller of the two scoops, which is the same one I use for cookie batter. * It called for 1 1/2 lbs. of ground beef but I used 2 lbs of ground turkey instead. * It said it wasn’t a particularly saucy recipe and that you could double the sauce. Since I prefer saucier than not and since I was using more meat than it called for, I did opt to double it. *The directions called for making the meatballs and baking them right in the sauce for 30 minutes. I wasn’t all that comfortable with putting the raw meat into the sauce, so I baked them for 15 minutes first, added in the sauce and then baked them the rest of the time in the sauce. *I left about 12 out of sauce for those who wanted plain. I’m glad I did. We all tried both and we all liked both. I made sure to bake these in a deeper casserole dish rather than on a baking sheet, so that there’d be plenty of space for the sauce. Below is Mel’s recipe, just as she has it here on her site. I encourage you to try it out and take a look at some of the other recipes on her site as well! For the meatballs: Combine all of the ingredients and mix well. Form into about 12 balls, eacha bout 2 inches in diameter. Place in a casserole dish. Cover with sauce (below). Bake at 350 degrees for about 30 minutes. Serve over rice. Freezable Meal: After covering the meatballs with sauce, cover the pan with two layers of aluminum foil and freeze. To bake, preheat the oven to 350 degrees and bake covered without thawing for 1 hour. Uncover and bake 20-30 minutes more, until meatballs are cooked through. You can serve this over rice for a perfect combination of flavors! Since it’s a frost-on-the-ground type of morning here in New England, I thought I’d post one of my favorite fall meals for you. I have posted this on FB before, and I even saw a friend on Facebook post it last night for her followers as well. It’s on my list of meals to make for dinner this week myself. I just bought a bag of cranberries on my last shopping trip. With Thanksgiving coming, I will be posting a few different cranberry recipes in the coming weeks as well. This is a meal that my entire family enjoys and a meal I’ve made often for company and so far it has always gotten rave reviews. Enjoy! Return chicken to skillet. 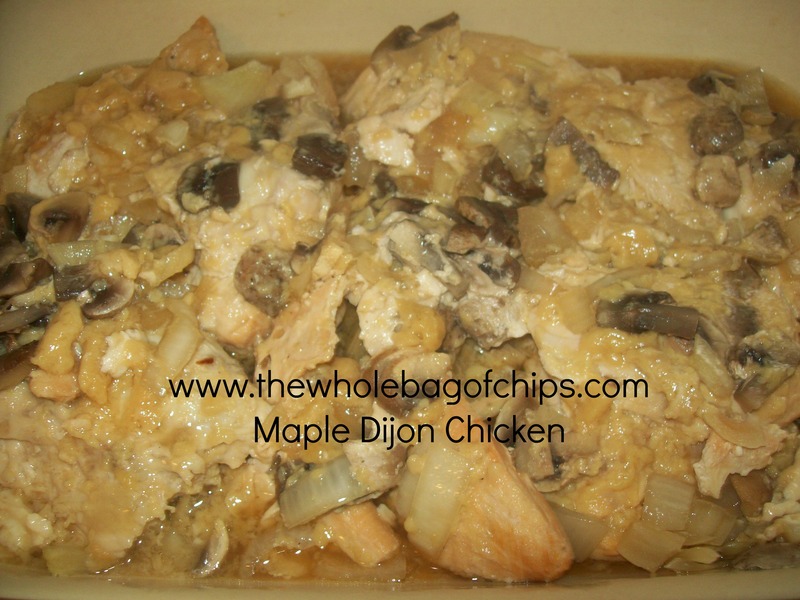 Cover and simmer for 20-30 minutes or until chicken is tender, basting occasionally with the sauce. Serve over rice. Yield 4-6 servings. Elizabeth was so proud of this dinner. She requested it and she made almost the entire thing herself, with very little help from Daddy! This was by far, one of my favorite crock pot meals from the first week. Every single one of us loved them. I’ve been keeping you all up to date with our ongoing crock pot meals experiment as the school year goes on. I must say, so far so good. The one I’m sharing today, however, was by far my personal favorite meal of all the ones we have tried thus far. 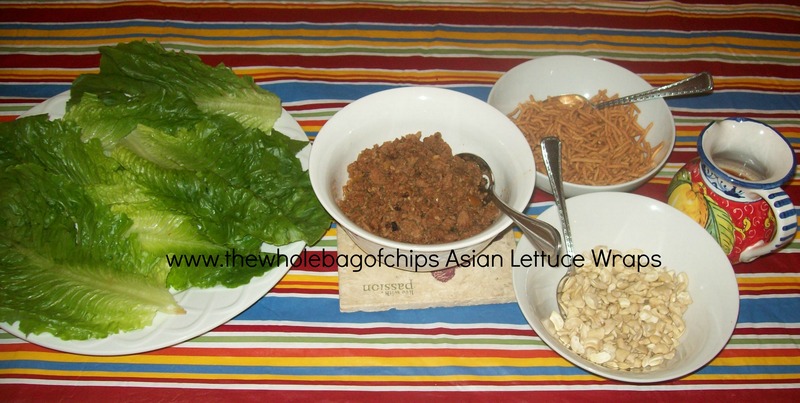 It is a recipe for Asian Lettuce Wraps and it’s the meat that you cook all day in the crock pot. My house smelled absolutely amazing on this day, thanks in part to the sesame oil that is used in the recipe. This was one I could not wait for even the next day, so that I could use the leftovers for my lunch. In a way, it was almost like our DIY taco night, but with an Asian flair instead. Serving everything “on the side” allows people do customize their wraps, adding as much or as little of whatever the want to each of their wraps. I served everything a la carte, with Chinese Fried Rice as our side dish, and I let everyone build their own wraps. I wasn’t sure if everyone would try their food in the lettuce or not, but I encouraged them to at least give it a try. I ended up having to put out even more lettuce as each of us had two or three wraps that night. 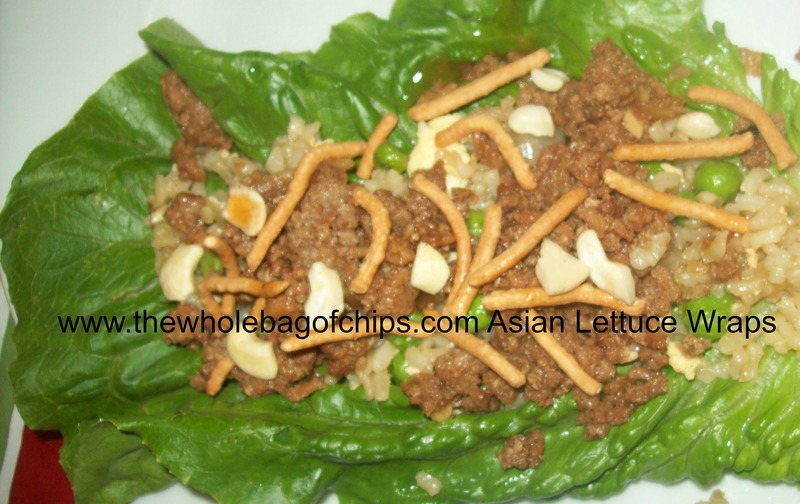 The wrap that is pictured above (before being rolled up and eaten) actually has the rice on the bottom, followed by the meat and then the Chinese noodles, chopped cashews and the sauce. I saved the sauce as leftovers as well, and the next day I used it to make my leftover wraps for lunch, but the following day I just had the leftover rice and used the sauce on top of that. Perfect. Although most of my crock pot recipes have been coming from the Who Needs a Cape website, this one actually didn’t. It was sent to me by my friend Gina, who is doing this crock pot recipe experiment along with me, far away in another state. But we’re trying out some of the same recipes and then some different ones, and letting each other know how they are. This is one she tried out first and loved it, passing it along to us. We loved it too. She found it at Today’s Creative Blog and I’ve linked to it above. The recipe is below, as well. So today, I am passing it along to you as well. It was very different for a crock pot meal, and you’d never know it was made in the crock pot. It was fun and unique and tasty. I encourage you to try it out, and if you’re up for it, give the Chinese Fried Rice a try too. We use that as a side dish often and it always goes over well. 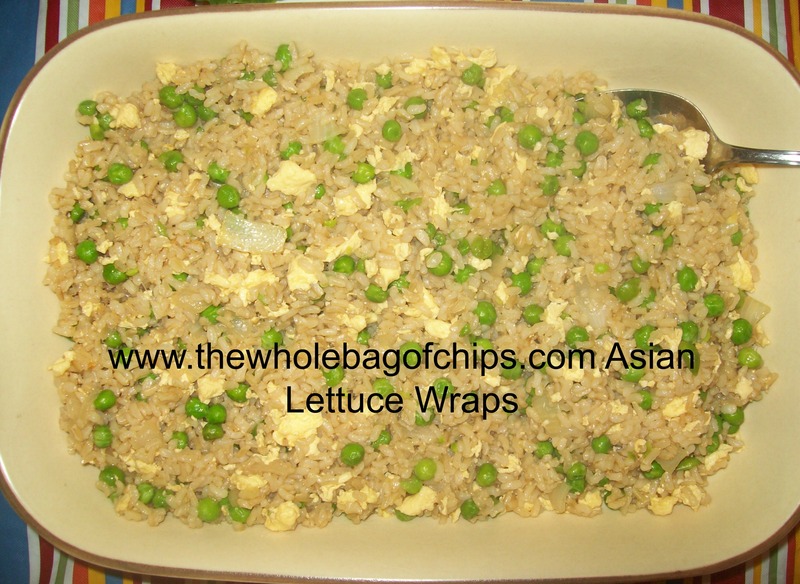 The fried rice was great with the dipping sauce right on top, and some of the wraps had the rice right inside! On the table and ready to eat! And of course, back to work time. That makes cooking dinner time quite complicated. This fall, for the first time, everyone’s every thing is on every night, with pick ups and drop offs in and around dinner time. Most nights we can eat together but most nights there is going to be no one home to cook. As I looked at my schedule for the next eight weeks, I knew I had to come up with a solution, and fast. If I could figure out how to get everyone everywhere and home again, I needed to have a meal waiting when we got here. Eating together is really important to us, and so is eating a home-cooked, healthy meal. Around the same time I was contemplating my fall schedule dilemma, a friend of mine, Gina, forwarded me a link to the blog whoneedsacape.com, Specifically, to the 40 Meals/Four Hours recipe collection. I was sold. It looked like exactly what I needed–the ability to prep meals way ahead of time and cook them while I was gone on the days that I needed them. It almost sounded too good to be true. 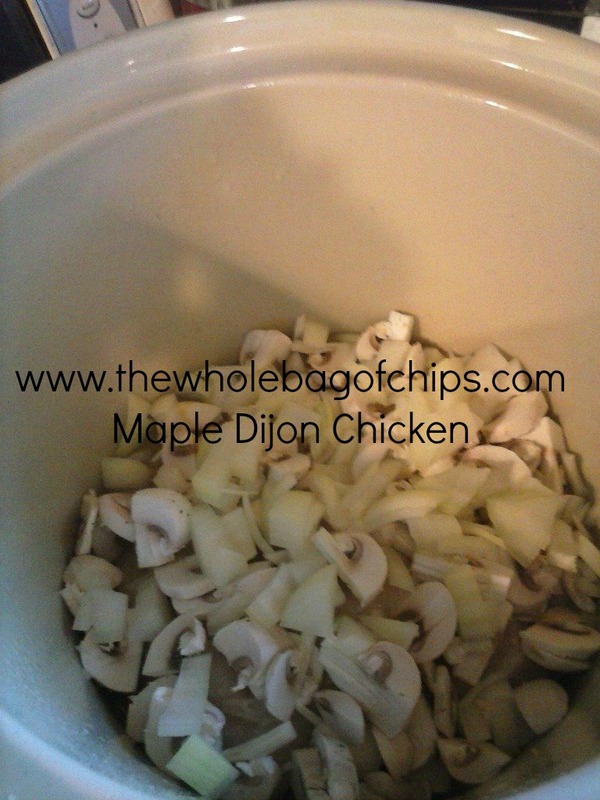 Very rarely have I found a crock pot meal that we all like, that I’d want to make again. But, with so many options to choose from–more than a dozen recipes, all of which could be prepped ahead, it was worth a try. I decided that rather than prepping several sets of any one recipe, I’d instead go through the list, see what sounded like things my family might like, and try each one just once. If they were successful, then I’d prep more of the ones we liked for the future. Elizabeth happened to be around when I first received the link. We clicked through and looked at every photo, every recipe. We came up with a list of those we wanted to try. It seemed doable. This week alone, I’ve got several of these recipes on my list to try out. The very first one, made on Monday night, was a keeper, according to my family. As I try each one, they’ll appear on future “What’s For Dinner Wednesday” posts if they’re deemed worthy by my family. Maple Dijon Chicken was the one I chose to try out first. I opted to switch out the chicken thighs that it called for, switching in boneless, skinless breasts instead. The recipe was simple and quick to prep, which I liked. I could have prepped it ahead and froze it, but this time I didn’t need to. I had some time in the morning to do it. The house smelled great all day long! I love that about crock pot cooking! Here is the recipe as found on Who Needs A Cape.com, with my few modifications. Give it a try and see what you think! I served ours with brown rice and veggies on the side. Thumbs up all around! Throw it all in the crock pot and turn it on!